Here we are on the brink of the holiday season and I am feeling peculiarly calm. In past years, I often end up frazzled and overwhelmed with the thoughts of the china that needs cleaned, gifts that need purchased, cards to be mailed, cookies to bake, and negotiating work and vacation time. So much so that I would basically breathe a sigh of relief when January rolled around. I really don’t like that trait about myself; the fact that I am always thinking ahead to the next step and I forget to enjoy the present. There is a quote I really love, “Wherever you are, be all there.” My goal this holiday season is to be all there. To soak it up and to actually savor the Thanksgiving turkey we’ve worked so hard to prepare, to sing along with the Christmas tunes blaring through the speakers, and to put my phone away when we’re curled up on the couch watching National Lampoon’s Christmas Vacation. One of the ways I’ve improved my ability to be more relaxed during this hectic time of year is to make dishes that can be prepared ahead of time (superb timing for a cookbook release, Ina Garten!). 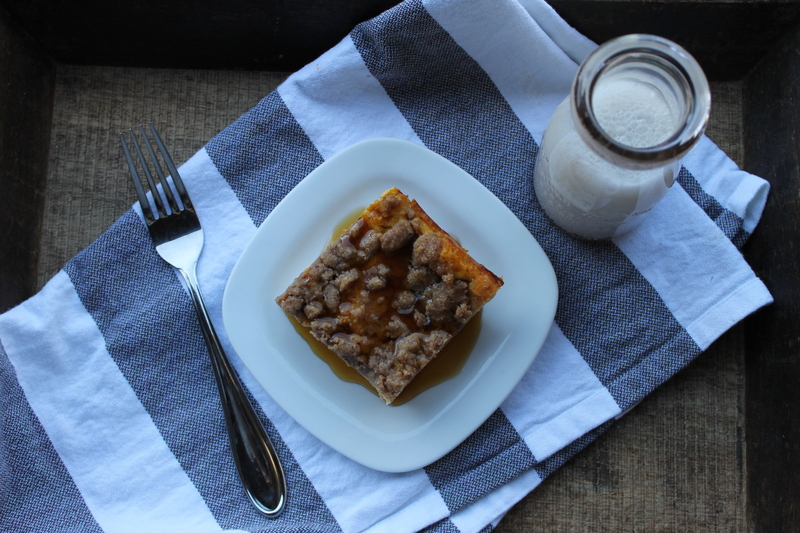 This baked pumpkin french toast is a perfect example and would be great for Thanksgiving weekend if you have guests staying over or it would make a fabulous addition to a Christmas morning brunch. 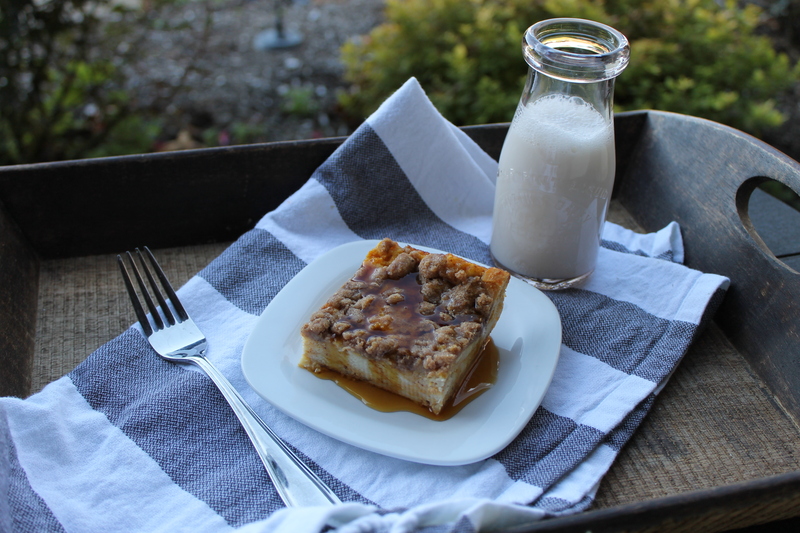 It’s warm and comforting and really lovely served with a little drizzle of maple syrup and a tall glass of cold milk. Have a great weekend, everyone! Here’s to focusing on the now and enjoying today. 1. Grease a 9×13 inch casserole dish with cooking spray. Cut the french bread into 1 inch cubes and place in the dish in an even layer. Set aside. 2. Make the streusel: stir together the flour, brown sugar, salt, cinnamon, and nutmeg. Scatter the butter over the flour mixture and use your (clean) hands to combine until it looks like oatmeal flakes. Cover and store in the refrigerator. 3. Assemble the french toast: Place the milk, pumpkin, eggs, sugar, vanilla, cinnamon, and nutmeg in a large bowl and whisk together until well-combined. Carefully pour this mixture over the bread. If the bread pieces aren’t fully submerged or they start to float, you can gently press them down with your fingertips. Cover and refrigerate overnight. 4. When you are ready to make the french toast, remove the casserole dish from the refrigerator. Preheat the oven to 350 degrees. While the oven preheats, sprinkle the streusel topping on top of the bread chunks. Bake for 50-55 minutes, or until the french toast is puffed up and golden brown. Remove from oven and serve with maple syrup. Enjoy!